Birds (class Aves) – winged, bipedal, endothermic (warm-blooded), egg-laying, vertebrate animals. There are around 10,000 living species, making them the most varied of tetrapod vertebrates. They inhabit ecosystems across the globe, from the Arctic to the Antarctic. Extant birds range in size from the 5 cm (2 in) bee hummingbird to the 2.75 m (9 ft) ostrich. Life form – entity or being that is living or alive. Animal – multicellular, eukaryotic organisms of the kingdom Animalia (also called Metazoa). Their body plan eventually becomes fixed as they develop, although some undergo a process of metamorphosis later on in their lives. Most animals are motile, meaning they can move spontaneously and independently. 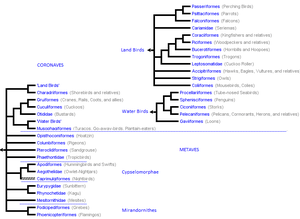 Cladogram showing the most recent classification of Neoaves, based on several phylogenetic studies.